Painkiller: Heaven's Got a Hitman Game Review - Download and Play Free Version! Kill Hell's Minions to Earn an Afterlife in Heaven! 24 levels featuring 5 different bosses for a large amount of playability. Four different difficulty modes so you can play at your skill level. Hidden items in levels add to the replayability. Loading levels can be slow. Sometimes objectives or where you should go is unclear. In Painkiller: Heaven's Got A Hitman, play the part of Daniel Garner, a man who just died in a car accident and is now trapped between heaven and hell. To earn an afterlife in heaven, Daniel must pay a price. There's an unholy war being waged in the underworld and Daniel's mission is to stop it. Battle through hordes of zombies, skeletons and other hellish monsters and destroy Lucifer's army generals and end this war! In this intense first-person horror shooter, you must shoot and kill all enemy monsters. Battle your way through tons of levels packed with underwordly monsters to get to Lucifer's generals. Find bonuses along the way like ammunition, armor and new weapons, including five guns with powerful secondary fire like the Chaingun with a rocket launcher attached to it. Collect your enemies' souls to gain health and once you collect 100 souls, you can temporarily turn into an invincible demon with awesome powers! Enjoy the thrill of blasting through well-designed levels and taking out tons of enemies with outrageous weapons and heavy metal background music! 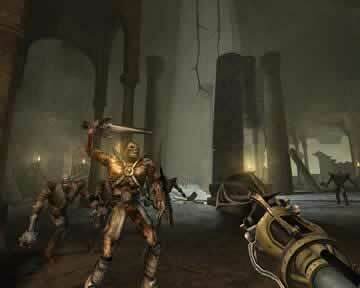 With simple controls and four difficulty settings even a beginner can put a stop to this war of the undead. The killer 3D graphics and intense gameplay are sure to keep anyone clicking. This game will give you adrenaline rush after adrenaline rush and the more you play, the less you'll want to quit playing. Download Painkiller: Heaven's Got A Hitman now for a thrilling battle through the underworld! Endless hordes of demons are preparing to wage war on Heaven and it is your job to destroy them all. 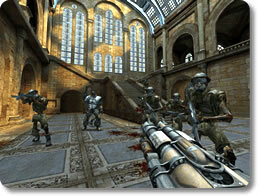 Painkiller is a good first person shooter (FPS) game. Using a variety of powerful weapons you battle your way through 24 unique levels including 5 boss fights. You fight through Purgatory and even Hell in your quest to be accepted into Heaven. You play as Daniel who recently died in a car crash. His wife went on to heaven while he is stuck in Purgatory. Daniel must defeat Lucifer's four generals to make amends for his misdeeds in life and earn his place in Heaven. Along your journey you meet various characters that help you on your way to defeating the generals. In the end you even fight Lucifer himself. Along the way you will encounter countless demons of various types that you have to vanquish in order to continue on your way. There are also hidden objects and side objectives that can be completed to obtain Black Tarot cards. These cards can be equipped to give you in-game bonuses such as a damage increase or slowed time. 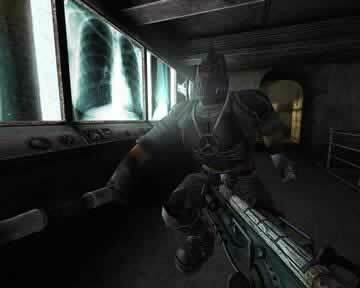 Painkiller is a FPS that is controlled like most others-- using the WASD keys for movement and the mouse to aim and fire. You can also customize the controls anyway you like. There are only two modes of play: campaign and multiplayer. In multiplayer you can compete online against other people. The campaign consists of 24 levels that seem to span time and space. You will fight in ancient castles and modern military bases. Included in the 24 levels are five boss fights. The boss fights are much more challenging than the standard levels and have one monster with much more health. You have a large array of guns at your disposal to fight the demons. You'll use guns like the chaingun or the wooden stake launcher. All guns also have two modes of fire. The chaingun shoots bullets and rockets, the wooden stake launcher shoots grenades in addition to wooden stakes. You can also earn Black Tarot cards that give you things like bonus damage or reduce the damage you receive. In addition to all your weapons you also have a demon mode. To activate the demon mode you have to collect souls, once you have enough you become an invincible demon that can destroy other demons with your mind. The developers did a great job with the graphics in this game. Everything is well detailed and all the guns are unique and fun to look at. The interaction in the game is excellent and there are several objects will react when you touch them or shoot them. Sound effects are also well done. All this combines to make a game that pulls you in and makes you feel like you are really there. There are a few minor issues with the game. It takes several minutes to load a level after you have died or advanced to the next level. While this is only a minor inconvenience, it is frustrating when you want to get to the next level. Also while playing, you have an arrow that directs you where you should go next but this is not always clear. The arrow merely points to the next checkpoint or the last monster you need to kill. If you can't find the checkpoint there is no other form of help. his game might not be suitable for younger player with the amount of violence and gore. Any fan of Doom or FPS's in general should definitely give this a try. Take a look at the intense gameplay found in Painkiller: Heaven's Got a Hitman.